Marine Corps Security Force Co. The world's first non projectile, force on force, firearms tactical training system that creates stress during training. Click here to view the full video on our video page. After several years of extensive research, Shocknife Inc. has developed the Shocknife Spontaneous Edged Weapon Defense Instructor Course. This course is unlike any other edged weapon course being offered today to LE. Shocknife filmed scenario after scenario of spontaneous attacks to identify how a human with minimal training will actually respond in these situations. The result is a system that accepts the natural human response and builds in a cognitive response once the brain has “caught up”. The system focuses specifically on sudden, unanticipated edged weapon attacks when the officer is not consciously prepared to respond. GSA for US Federal Government Customers!! Shocknife Inc. is now officially on the US General Services Administration (GSA) Schedule effective March 15, 2007. Our GSA number is GS-07F-0263T. For details see the News Archive. - MSG. Lettieri, Troy A. "I have over 30 years of combined training and experience in martial arts, corrections, law enforcement and military fields (USMC) and take great pride in my job. Saving lives is nothing to take lightly. Conducting realistic training to provide field proven techniques and strategies is one of my most important goals. Using the "Shocknife" allows me to show not only what works in real life and what will not work without injuring the student. This helps build proficiency, enhance officer safety, improve confidence, and ultimately results in saving their life! I would recommend ANY OFFICER or TRAINER who wants to validate their techniques in edged weapons to use the SHOCKNIFE! "The Shocknife is an excellent product that truly challenges students to perform at their highest level. It provides the ideal balance of realism and safety and is an excellent addition to any reality-based self-defense program." "When you get in a fight, the adrenaline is so high that it can cause you to freeze up. The only way to prepare for this is to make your training as real as possible. In the edged-weapon category, there is no better way to simulate a real knife fight than by using the SHOCKNIFE." 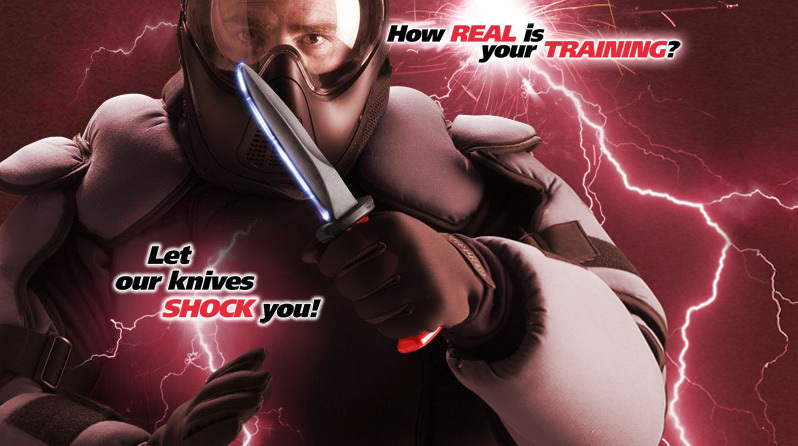 - Co-Founder of SIMUNITION® and author of the book "Training at the Speed of Life - The Definitive Textbook for Police and Military Reality Based Training"
"If you want to take your reality based training to the next level, I would highly recommend the Shocknife. This exciting new technology is the closet thing to the 'real thing.' With proper guidelines in place, the Shocknife will definitely increase the effectiveness of student learning, enhance the learning environment, and maximize students survival skills. The Shocknife is the 'next generation' in fundamental teaching aides for maximizing students confidence in their survival skills." - Dr. Darrell L. Ross is the author of the renowned book “Civil Liability in Criminal Justice” and is a professor in the Department of Criminal Justice at East Carolina University. Dr. Ross is also an experienced and respected Defensive Tactics Instructor. "The Shocknife is as "reality-based" as it gets. The only way I can keep my students from touching a blade in training is by using the Shocknife. It ads an element hard to achieve in training - FEAR." The Shocknife is now standard equipment for my global system." Virtually unbreakable polycarbonate blade and handle. Breakaway soft rubber safety hilt. Heavy gauge metal Activator & Shock Adjustment Screw. Electronics epoxy sealed for protection. Gold used in place of lead on blade electrodes and electronic connections. Custom Cut-out Carrying Cases with ability to be padlocked. The Shocknife SK-2 is not available for sale to private citizens in the following states: DC, HI, MA, MI, NJ, NY, RI, & WI.